Soniah Kamal - The Space Between Us. The class novel specific to the servant-employer relationship has been written about evocatively in novels such as Rohinton Mistry’s A Fine Balance, Mohsin Hamid’s Mothsmoke and Rupa Bajwa’s The Sari Shop. 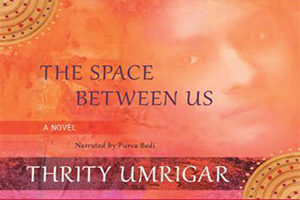 Thrity Umrigar’s second novel — her first was the much acclaimed Bombay Time — The Space Between Us also explores this dichotomous relationship in particular amongst women. Sera Dubash is a well off middle class Parsi widow who lives with her son-in-law Viraf and pregnant daughter Dinaz. Bhima has worked for Sera for the past twenty odd years and lives in a slum with her orphaned granddaughter, Maya, also pregnant albeit out of wedlock. The Space Between Us pivots between these two pregnancies as well as Sera’s and Bhima’s pasts: their dreams, their consequent marriages, and their pursuit of happiness. Over the years Bhima and Sera have seen each others lives enfold and have often found themselves playing pivotal roles to each other. When husband Gopal abandoned Bhima, Sera supported her and when Maya’s parents died of Aids — one of the stronger written parts of the novel — Sera took on the financial responsibility of Maya’s education. In her turn Bhima knows exactly what Dinaz likes to eat and how to prepare it and she’s fully cognizant about Sera’s abusive marriage and often massages her employer’s broken body and ego after a beating. Umrigar has successfully rendered how women from different sides of the track can be derailed if the men they are dependent on are no good. Gopal’s wooing of Bhima is a beautifully wrought part of the novel as is their early idyllic life together. Unfortunately Gopal falls victim to the clichèd fate all of Umrigar’s male characters do: he is ultimately a cad. Even Sera’s somewhat decent father-in-law suffers from a callous spinelessness: why can’t he stand up to his mean spirited wife who makes Sera’s life a living hell the reader never can glean, and why his wife is so mean spirited is another mystery to which no clues are offered. As for Sera’s abusive husband, the space between him and Gopal is not such a stretch despite the former’s education and the latter’s lack of since both cause their wives deep unhappiness. Perhaps education — the lack of which is convincingly depicted as to blame indirectly for Bhima’s problems — is not the cure to ignorance as Bhima so earnestly believes? Sera’s husband’s death and mother-in-law’s debilitating illness finally free her of their stranglehold and the novel opens with a relaxed Sera cracking jokes with her beloved son-in-law and twittering over her daughter to eat more and work less; they are a contented family and the coming baby is a joyful event in stark contrast to Bhima and Maya’s situation. The novel unfortunately does not even contemplate — one of the many instances it fails to dig deep into contrasts — what might have occurred were the situation reversed and had it been the privileged Dinaz about to face single motherhood and the headstrong Maya who was with child in a marriage which she believed exemplary. Maya’s pregnancy brings nothing but woe to Bhima who long awaits the day Maya’s education will enable them to get out of the dirty slums. A native of Bombay, Umrigar crosses deftly from Bhima’s slum dwelling where gathering water is a daily chore to Sera’s drawing room soirees where soft drinks are served with aplomb. For the most part the novel has Bhima and Sera interacting on Sera’s turf and so it is interesting to see Sera’s reaction and treatment when she visits Bhima in the slum. Indeed upon seeing the squalor Sera whisks the ill Bhima away, at least until she heals, and it is fascinating to see these two women navigate the often fraught dance of familiarity and formality between employer and servant in the East. Sera will allow Bhima to massage her but feels dirty having her sit on her sofas. Bhima can turn to Sera to find a solution for Maya but knows full well she will get a verbal lashing if she arrives late to work two days in a row. If all men are wicked in this novel then all domestic servants have a very soft heart when it comes to their employers. Servants are poor but poverty is not a guarantee of wisdom or kindness or loyalty; however, The Space Between Us does not offer this balancing view. Bhima constantly berates Maya and furthermore, upon learning the identity of the father, continues to blame her until Maya tells her exactly what happened. However once Bhima knows she chooses not to tell Sera for fear of causing her grief. Bhima’s misguided loyalty brings the novel to its close as she trusts till the very end that Sera will dole out justice. So, the poor make devoted servants but the well heeled always stick together? In fact when Maya displays a resistive spark the reader is unclear about whether this is due to her personality or because of the confidence education may have instilled in her. Maya’s spark is erratic and she fluctuates from being either pathetic or unnecessarily aggressive, consequently the reader cannot grasp who she really is and is left in the dark about simple things such as how this girl from the slums feels about attending college. Except for Bhima and Sera, Umrigar leaves the other characters underdeveloped and this leaves the novel a poorer read. The climax of the novel in which Maya’s seducer is unveiled and confronted mirrors hackneyed Bollywood film plots, as does the ploy the seducer uses to shame Bhima. That the poor are exploited routinely by the rich is nothing new, however it is a fresh approach that can turn old to gold but it is an approach Umrigar fails to conceive at least in this particular plot line. The Space Between Us is an interesting read for many of the issues raised. Can employer and servant ever be “friends”? What, in this context, does it mean to be friends: being able to share life stories, bolstering each other up, offering extra money, offering a free massage? Does family always come before justice and decency? Is blood really thicker than water and what does this bode for society at large? However, for all its questions, a far richer story of class difference, of the spaces between the “us” and the “them”, of the way women come together, or don’t, might have been explored by continuing or indeed beginning this novel where it ends.